Individually made dichroic glass squares and grooved along the sides for a simple wire wrap design, crafted by Karen Nan Varela. 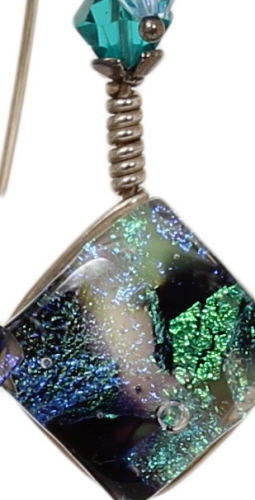 Shades of black, blue zircon, sapphire, bright and lime green, on a white background, can be seen. Accented with Swarovski crystals. Sterling silver wire is used. Earwires hand formed. 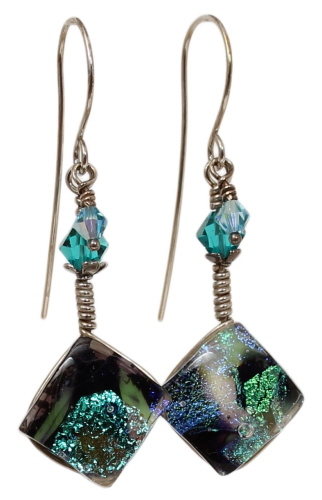 Earrings measure just over 2 inches from top of earwire to bottom of dangle and weigh just 0.15 oz each.